Gage Roads Brewing Company have released a couple of cracking limited release beers in their lifetime. A long time ago I was working as a rep for them and they released a Saison and a Trippel – one of them was sensational but for the life of me, and probably due to a number of years and beers passing, I can’t seem to remember which one. 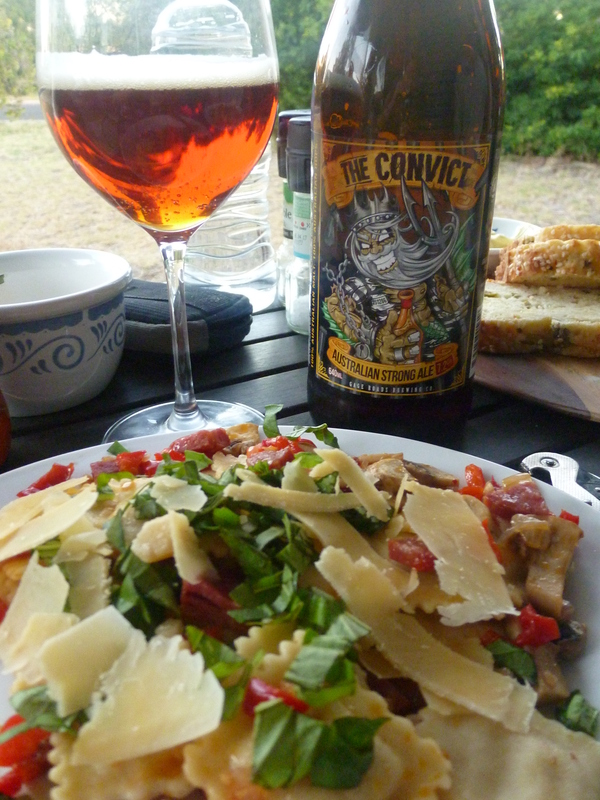 Fast forward five years since then to 2013 and I was at home about to open a bottle of Gage Roads The Convict, an Australian Strong Ale on the eve of Australia Day. It just seemed like the right thing to do. 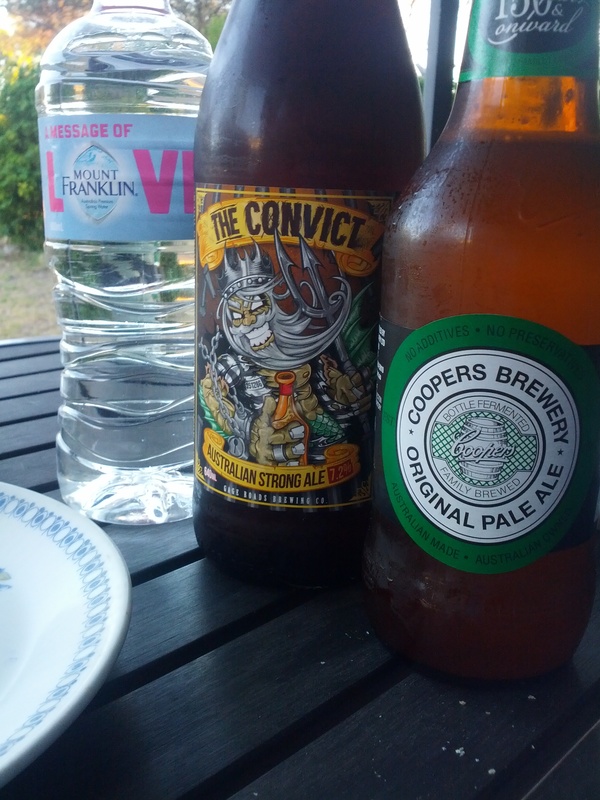 Of course I spread the love across a few Aussie brands – Mt Franklin for water and Coopers Pale just because it’s an icon! Happy Australia Day! 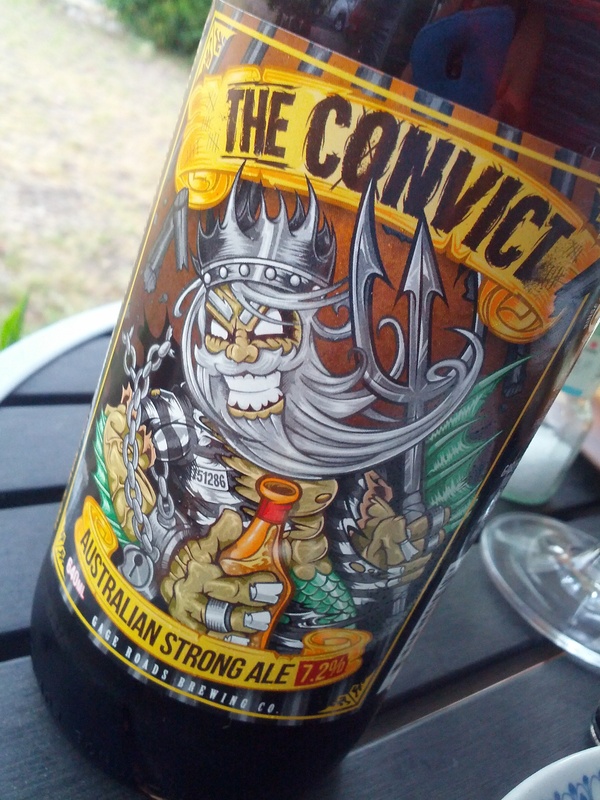 I picked up The Convict at Cellarbrations Carlisle, where all good beer can be found, and it was the last bottle left so I felt a little guilty whilst I was at the register as another customer requested a bottle. Whoops, sorry! I genuinely hope they found another bottle. It’s got dark fruits, rich caramel and biscuit flavours all mingling together with a strong bitter finish. At 7.2% abv it is strong enough to let you know it’s boozy but doesn’t dominate or slap you in the face. Having said that my partner and I shared just a single bottle over dinner so perhaps it would be a different story if it were on tap at the pub; the next morning may not be so rosy after multiple pints of this tasty brew. Dinner match was a Chorizo and Chili Ravioli with Fresh Basil and Parmesan. It was a nice enough match though the dish lacked anything along the sweet-ish lines to go with the strong maltiness of the beer. I’m thinking a beef ravioli with some sweet paprika would have done the trick. I guess I’ll have to get another bottle to find out! If you can get your hands on it you should try this beer, check out Cellarbrations Carlisle, International Beer Shop and Dan Murphy’s for stocks.